The age of the rock star, like the age of the cowboy, has passed. Like the cowboy, the idea of the rock star lives on in our imaginations. What did we see in them? Swagger. Recklessness. Sexual charisma. Damn-the-torpedoes self-belief. A certain way of carrying themselves. Good hair. Interesting shoes. Talent we wished we had. What did we want of them? To be larger than life but also like us. To live out their songs. To stay young forever. No wonder many didn't stay the course. 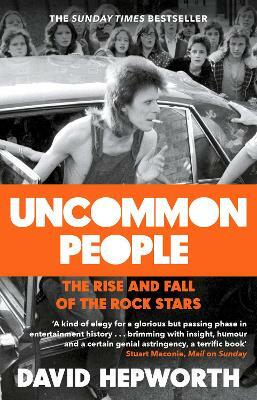 In Uncommon People, David Hepworth zeroes in on defining moments and turning points in the lives of forty rock stars from 1955 to 1995, taking us on a journey to burst a hundred myths and create a hundred more. As this tribe of uniquely motivated nobodies went about turning themselves into the ultimate somebodies, they also shaped us, our real lives and our fantasies. Uncommon People isn't just their story. It's ours as well.